Here’s news of a new bluegrass ensemble from the across the ditch. New Zealand group Hot Diggity have recently formed and have wasted little time in putting together a schedule of appearances. 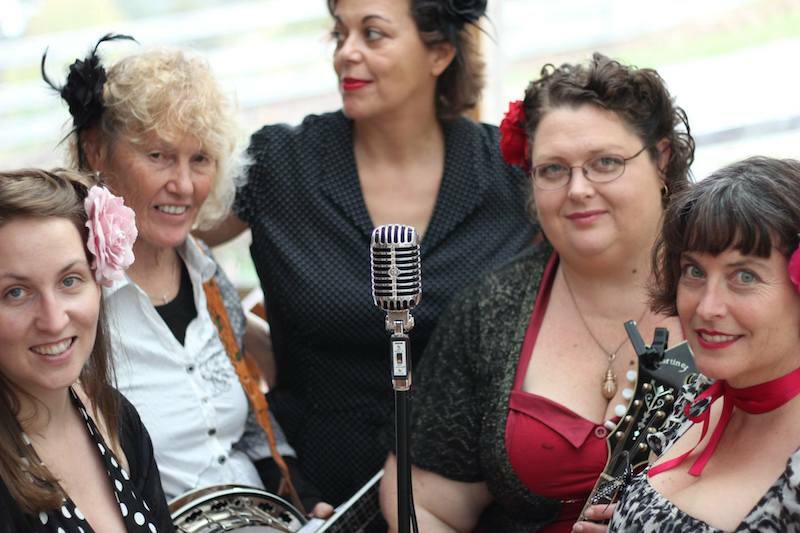 This may well be the only all-female bluegrass band in Australasia currently. Deborah Mackenzie: Deborah has always loved to sing. Growing up in the Salvation Army gave her a great introduction to music and harmony. Previously Deborah sang in a three-part harmony trio in Auckland called the Wendy Lus. In 2010 she released an album of originals, “The Ride”, with Peter Neumegen. Deborah plays in an acoustic group called Rainberry Pie which explores many acoustic styles from alt-country, western swing, bluegrass, and pop. She is a singer-songwriter who enjoys her guitar, but loves to sing. Jenine Abarbanel: Jenine came to music late, learning to play the upright bass in 2006 as a way of combatting her relocation blues after moving to NZ from the US in 2005. A singer since childhood, her vocals are most often compared to Natalie Merchant and Gillian Welch. 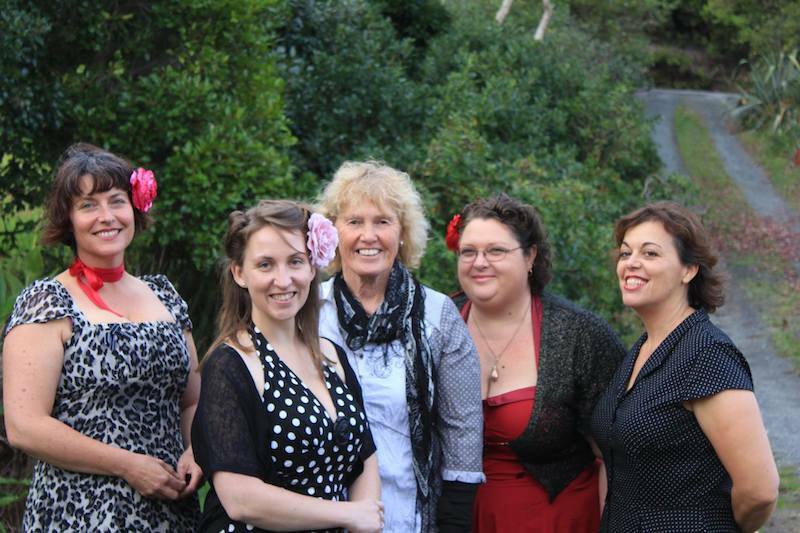 Jenine is the lead vocalist and bass player for popular NZ Bluegrass band The Pipi Pickers. Jenine often says that what she lacks in talent and skill she makes up for with energy and enthusiasm. (For those who have seen Jenine in action with the Pipi Pickers will know there is no lack of talent there – Editor). Heather Carrigan: Heather has been involved in music from an early age, enjoying the mandatory education that comes with having performing musicians as parents performing throughout her childhood. She explored many genres before finally finding a musical home in Bluegrass. Having played in bluegrass bands in Australia and the United States, Heather is enjoying a new Bluegrass adventure, playing with Hot Diggity. She’s thrilled to have her original material performed by such a great group of talented women. Slávka Franclíková: Originating from the Czech Republic, Slávka is a classically trained violinist (she started playing the violin in 1992). In 2004 she met the Czech bluegrass band Namodro and joined them for the next 8 years. In 2012 she came to NZ and played for a short time with the girls band “Manuka Hunnies” in Christchurch and with guitar & violin duo Slingshot & Seashell. She has since moved to Auckland and is enjoying adding some solid fiddle licks to Hot Diggity. First will be on July 9th at the Auckland Bluegrass and Old Time Country Music Club at the historic Devonport Bunker. And we’ll be at the Thirsty Dog Folk Club on Karangahape Rd in Auckland later in October. Jenine tells us that they are quite a diverse bunch of women with their ages ranging from 26 to 60. Each live in towns hundreds of kilometres apart they meet in Leigh New Zealand for their rehearsal gigs. Jenine lives in Leigh, while Slåvka and Deb in Auckland, and Heather and Sue in Dargaville and Whangarei, respectively. The one thing they all have in common is a love of Bluegrass and a great joy in playing and creating together. We are primarily playing original compositions by Heather and Deb, with a few traditional Bluegrass songs thrown in. Look out for the group in 2015 as they begin the process of applying for festival in New Zealand and Australia. Perhaps an all-female line up for MountainGrass 2015?